Some Clare students are facing annual rent bills of €7,500 for a shared bedroom in student accommodation in Dublin, and those are the ones who can find a place to live. Describing the situation as an “accommodation crisis”, the Union of Students in Ireland (USI) has called for “urgent action” to address the housing shortage. NUI Galway confirmed to The Clare Champion that it has sent out 11,000 leaflets to homeowners in the city in an effort to expand its student accommodation portfolio. A general shortage of houses in Galway City, as well as lengthy social housing waiting lists, have compounded the issue. Clara Malone (20) from Bodyke is a third year student at NUI Galway. Despite spending weeks searching, she said “it is almost impossible” to find a house or an apartment. Clara said there seems to be an under-supply of available houses for students in Galway and despite dedicating significant time and effort she has made little progress in recent weeks, while many of her friends are also struggling. “I have viewed 10 properties so far with a friend and we’re actually up looking today [Wednesday] and we’ve been up other days viewing and it’s just absolutely impossible to find anything,” she said. Clara, who has a summer job in Tuamgraney, said there are lots of pages on Facebook that document the difficulty many Clare students are experiencing in Galway. “Even throughout the college, there are people posting on pages still looking for accommodation because there’s just nothing around. Clara said another problem is that a lot of tenants are looking for postgraduate students and mature students, so that is another obstacle to undergraduate students. “In an ideal world, they’re not really looking for second years, first years, anyone like that. Since we’re going into third year it should be a little bit easier but it’s still difficult enough,” she noted. Despite the obvious preference landlords have for mature students, Clara said the influx of first year students next week will make the situation even more difficult. Clara said her search for accommodation this summer has been the most difficult she has experienced during her third-level education. USI president Kevin Donoghue said there are accommodation shortages in Galway and Limerick, as well as larger cities like Dublin and Cork. He said digs will alleviate the problem in the short-term but longer-term additional measures are urgently required. He said increasing financial supports for students who live 24km to 45km away would be a positive start. “There needs to be other supports to help those who are struggling and can’t even afford digs. An increase in the Student Assistance Fund would help many students who will struggle to pay for basic utilities in the coming months, due to increased rent and travel costs. 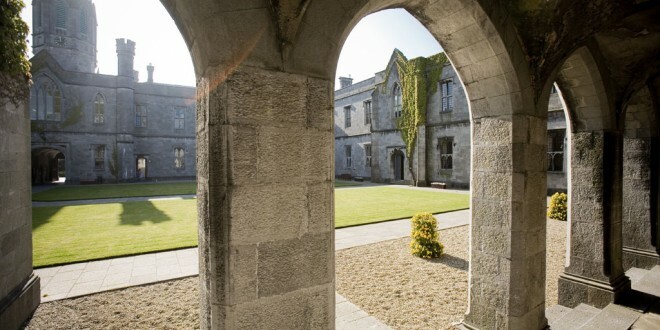 Teresa Kelly, an accommodation administrative officer at NUIG, said the shortage of accommodation in Galway is similar to the problems being experienced by many students in Cork and Dublin and she said the university is trying to address it. In 2017, after the construction of further housing units, NUI Galway will have the capacity to facilitate an additional 400 to 500 students in purpose-built on-campus accommodation. There are currently 2,500 students living on-campus at NUI Galway and Ms Kelly said half of those students are first years, as they have priority. “There is more bed space coming on-stream. The university and the building office are trying to solve the accommodation issues as best we can but we realise we are short and there is no new buildings yet,” she said. One North Clare parent confirmed on Wednesday that accommodation for her daughter, who is in Dublin, is costing more than €725 per month for a shared room in a student apartment. The fee for the first semester had to be paid upfront along with a “deposit” of €1,000 to cover heat, electricity and utilities. A West Clare mother said her daughter, who collected her Leaving Cert results on Wednesday, applied for accommodation in two separate places already this year but was unsuccessful. “We are delighted she has done so well and that she will more than likely get the course of her choice, so we will be going looking for somewhere for her to stay today or maybe tomorrow,” she added. Councillor Pat Hayes estimates the cost of having one child at college is between €10,000 and €15,000 when accommodation, registration fees, utilities, food and books are taken into account. He believes courses should be shorter to ease the financial burden on families. “There are courses that could be done in three years that are gone to four and that means you are talking about €60,000: if you have three kids that is €180,000. What I find most strange is the amount of time students have off during their semesters. They are pencilled in for hours here or there but there seems to be plenty of time where they could have classes but don’t. “The more I see of it, the more I think some courses have been extended to suit the colleges and not the students or their parents who are paying for this. My general opinion is that colleges are doing it for financial gain and the people worst hit are those from middle-income families,” he added. Some schools in the county offer scholarships for a small number of students to attend third level education. In St Joseph’s Secondary School in Spanish Point, a bursary was available for the first time this year in memory of the late metalwork and engineering teacher, Jim Flanagan. Mr Flanagan’s widow, Breda, offered the bursary to mark the 10th anniversary of his death. Students at CBS Ennistymon have also received Tomar Trust scholarships to third level education in recent years.